Found! Leon Bibb Sings Folk Songs | Brad's All Vinyl Finds! Folk music encompasses many a style. 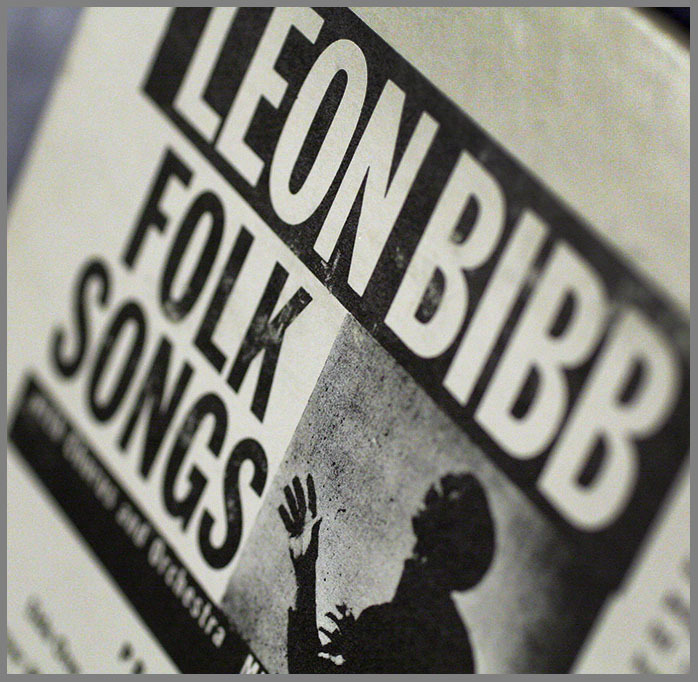 If you’re interested in the simple and elegant, Leon Bibb Sings Folk Songs (Vanguard VRS 9041, mono) is a good one. Bibb isn’t a part of the late sixties hippie scene that combined folk with rock. 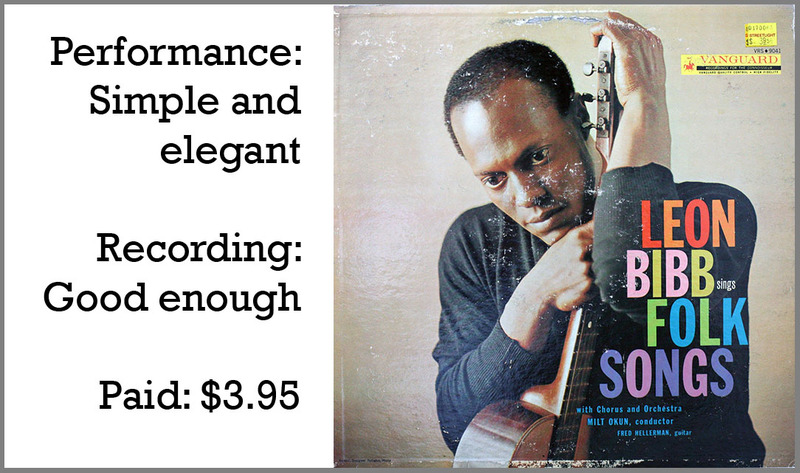 Bibb, guitarist Fred Hellerman and orchestrator Milt Okun provide the deep feelings that folk music is supposed to be about without the backbeat. Bibb might be a baritone, but if he is, he’s on the upper edge of it, just below a tenor. His voice has an authoritative quality that suits the music well. And not that I know anything about opera, but I’d call him operatic, too. On paper, the combination may not sound like it would work for simple folk music, but work it does. When he sings, you believe. Like many of Bibb’s LPs, he tackles tunes from long ago. Some are songs you might have heard as a kid and thought of as kid’s music. Bibb turns those tunes into something greater. Poor Lolette is one of those. You’ve heard this song, even if the title is unfamiliar. It’s better known as Skip To My Lou. Lolette has different lyrics, of course, but the melody has come down through the ages unscathed, originating in the 1840s as a creole tune. It still has that lilting feeling to it that Skip does. Kid’s lyrics can be silly, and Red Rosy Bush on paper, comes across that way. Imagine elementary school children singing “I wish I was a red rosy bush, on a bank by the sea and every time my true love passed by, she would pick a rose, off of me.” But Bibb? With a simple but haunting melody, Bibb turns it into adult, if sentimental fare. There’s more than kid’s stuff here. Skillet talks about being drunk and boozy, and getting a jug of brandy. East Virginia’s lyrics are that of a yearning love song, nicely accompanied by a pumping Hellerman’s guitar. Turtle Dove originated in England and sounds like a sea shanty, just the kind of thing that would have come across the Atlantic and found a home as an American folk song. You can imagine Judy Collins singing this one. The first time I heard Bibb, I had to get used to it. Not that it’s strange, I just hadn’t heard much folk music sung quite this way. But after awhile, he sounds like he’s on some back porch with a guitar as his only friend. And you’d be lucky to be there. Like most Vanguard recordings I’ve heard, it’s good, but not spectacular. It doesn’t compare to say, what Roy DuNann was accomplishing at the same time at Contemporary. It doesn’t jump outta the groove. It seems somewhat compressed. But it’s nicely balanced and doesn’t get in the way of enjoying the music. My copy of the LP was in pretty fair shape. Check out a short medley of tunes, direct from the LP! This is a nicely done LP for a night of contemplation and lyric consideration. If you find early American folk music to be of interest, give Bibb a try.